I had the privilege of interviewing my newest personal hero yesterday, attorney Elizabeth Lee Beck, about her legal team’s fraud case against the Democratic National Committee. One of the many useful insights that this straight-shooting mom on fire brought to light during our conversation was her story about a time she reached out to New York Times reporter Michael Barbaro to get some help cracking through the deep, dark media blackout on this extremely important case. Barbaro had previously interviewed Beck and featured her in a front-page story not long ago, so she had every reason to try and contact him. What happened next? “The little piss head blocks me,” Beck said. Why is a journalist for the New York Times blocking a potential source from contacting him? Why is the mainstream media refusing to go anywhere near a legal case that has heavy implications for the future of American democracy? You already know the answer to this deep down, whether you’re the kind of person who turns and faces reality or the kind of person who dissociates from reality at all costs while watching Samantha Bee and chugging cough syrup on the sofa. The function of the mass media is not to inform the American public of important things that are happening in their country, it is to turn attention away from the important things that are happening in their country and to keep them sleepy and compliant. The DNC lawsuit is one of the greatest threats to America’s power establishment right now, but only if people know about it. If the corporate media were to advance this story with even a fraction of the intensity that they’re advancing their xenophobic anti-Russia nonsense, they’d start waking up the sleeping masses to the fact that there is nothing resembling democracy happening in America at all. And the DNC’s own lawyers have indeed made it abundantly clear to anyone who’s been listening that there is no democracy in America. You cannot make the case that you are not required to provide real primary elections in a rigidly-enforced two-party system and still say that democracy is happening to any extent within your nation. Being forced to choose between two establishment-selected corporatists is not democracy, and this revolutionary lawsuit has been showing in no uncertain terms that this is exactly what is happening both in practice and in theory. In order to say that there is any sort of democratic process in America at all, there would have to either be a way to run viable independent and third-party candidates, or the people would have to be able to determine who the candidates will be for the two parties that they are permitted to choose from. Currently neither of those things is happening. Contrary to what they would have us all believe, these corporate media giants are not “the press”. They are a part of the press, and enjoy First Amendment protections for that reason, but they are not the press. The press also includes smaller outlets, alternative media, and all the bloggers and Youtubers who produce infinitely superior news coverage to anything the mass media propaganda machine is cranking out, yet are forbidden to ever take part in White House press conferences. While these thin-skinned megacorporations are crying about Trump’s latest tweet, those of us in the alternative media are trying to direct the American people’s attention to a lawsuit that presents a very real opening for the possibility of some semblance of actual democracy in the future. 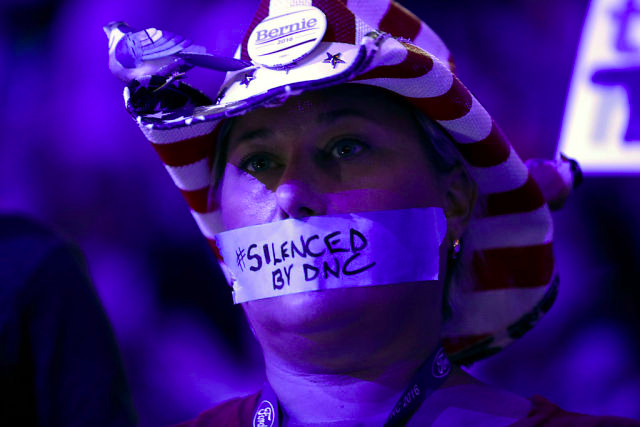 Just as it became evident that Trump had been fully digested by America’s unelected power establishment when the mass media pundits stopped calling him a Russian spy and started cheering his missile strikes in Syria last month, it is evident by the mass media’s refusal to cover the DNC lawsuit that it poses an existential threat to that same unelected power establishment. Remember, the motion-to-dismiss on the grounds that the DNC is under no obligation to provide real party primaries was the DNC’s first line of defense. That politically disastrous public position was their Plan A. If the lawsuit commences, can you imagine how bad their Plan B’s going to be? Can you imagine the spectacle of Debbie Wasserman Schultz and Donna Brazile being forced to explain how their many, many, many transgressions were not a blatant violation of the Impartiality Clause in the DNC Charter? Can you imagine DNC Chair Tom Perez dithering out an explanation to a skilled prosecutor as to how democracy can be said to exist in a strict two-party system where one of the parties actively sabotages the will of the people? There is simply no way that anyone who has read through the conversations in the more egregious DNC leaks, the Podesta emails showing that the DNC and the Clinton camp were colluding as early as 2014 to schedule debates and primaries in a way that favored her, or then-DNC Vice Chairwoman Donna Brazile acting as a mole against the Sanders campaign and passing Clinton questions in advance to prep her for debates with Sanders can truthfully say that this Impartiality Clause was adhered to. It wasn’t. They put a label on their product which was not the product they were selling. If this case moves forward (and there is no valid reason why it should not), the propaganda machine will be forced out of media blackout mode and into full-fledged damage control. If the case is dismissed, the American people will be shown clearly that their nation’s power establishment has no intention of ever giving them the ability to vote for what they want in any meaningful way, because we clear-eyed rebels will have been given hard, undeniable evidence to prove this to them. The DNC didn’t just sabotage Bernie Sanders, the DNC sabotaged you. Millions and millions of Americans decided to lift up an uncharismatic, disheveled-looking Senator from Vermont and carry him toward the White House completely unassisted by establishment media or corporate funding. Sanders never said or did anything new on the primary campaign trail; he just kept saying the same exact things he’s been saying for decades about economic justice and the need for drastic reform. Sanders wasn’t the real revolution in the last election cycle, you were. That organic populist uprising was what the establishment was afraid of, and that’s precisely what they sabotaged with their loyalists in the DNC. They sabotaged you. They subverted your will. It was you they were interested in breaking, not Sanders. On his own Bernie posed very little threat to them in the grand scheme of things, but a grassroots insurgency of people acting out their own will independent of the propaganda machine had them soiling their suits. And now their media mouthpieces are refusing to tell that story, so guess what? We’re gonna have to tell it ourselves. That same grassroots insurgency that we all took part in last year, in which we moved mountains and terrified the oligarchs without any help from establishment institutions, we can do that again. Keep hammering away on social media and alternative media about this DNC fraud case. Do not let it fade from memory, do not let it slip away from the spotlight, because it is where your oppressors are most vulnerable right now. Keep attacking. This lawsuit is one of the most significant anti-establishment phenomena happening in America today, and the more life you give it, the more power it will have.